Welcome! Here you can find the latest in technological advancement as well as fashion and design! We here at Neurolab created a truly unique experience for you to have! NEUROLAB is proud to present to you The NEW GENERATION of building! ALL IN ONE!! 4 – EASY Install, Rez the base of the tower. The top and the elevator will be rezed automatically. • 100% MESH + MATERIALS! • EASY REZZER+ Control System integrated! • FULLY MENU DRIVEN for OWNER whit many features.. (See Online Product page)! • 100% PHYSIC H.D LOW LAG! • SIZE: 32x 32 m.
– EASY Install, Rez the base of the tower. The top and the elevator will be rezed automatically. 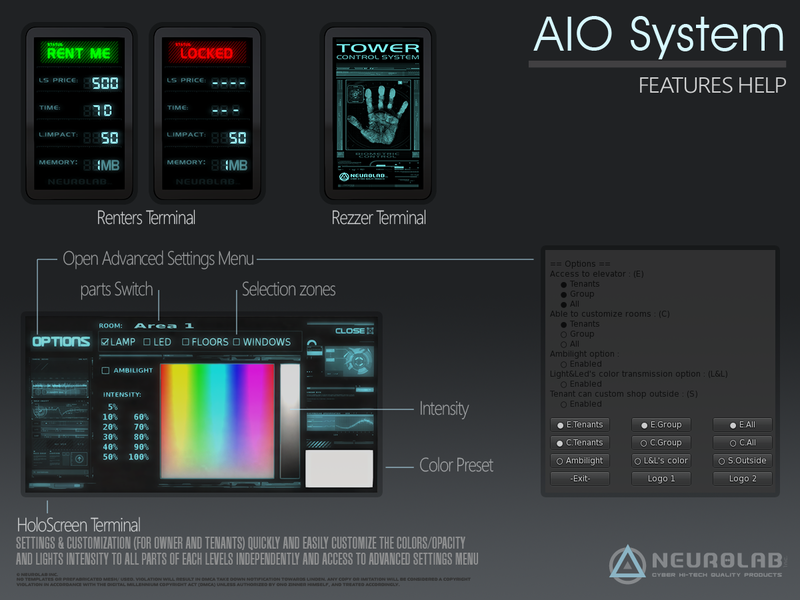 – Click on the Tower control system and select “New Tower” on the MENU. – Enter the number of levels from 0 to 30. Voila! The Holoscreen on tower Base can control this Floor and also all the levels and Synchronize/customize all this tower in one time! Click on “CUSTOM SYSTEM”, near the main entrance. This allows you to enable/disable the ambilight feature for all levels. Turning it off ensure no one use it and save some script time for the region. Many NLAB products use a custom color system that can work with light and led color set on tower’s hologram. You can allow the base’s tenant to custom the outside of this tower. You can decide who can custom levels. A tenant can only customize the level he’s paying for. You can decide who can use the elevator. “Tenants” is more than only the tenants, their admins and friends (set on the level, not the SL’s friends list) can use the elevator too if you allow tenants. – Each levels include a holoscreen. Tenants can use this one to customize their level. Click on “OPTIONS” on the hologram. ¤ ADMINS : manage admins list. Admins can customize this level and manage friends list. ADD BY SCAN : show people in a menu, a fast way to select someone. ¤ FRIENDS : manage friends list. Friends cannot customize this level but they can enter depending access permission. ¤ GET RELAY : gives a relay that allows to custom other NLAB products if you’re not the owner of this tower. For example the tenant can rez this relay and his own sofa from NLAB. His sofa will match the light color he set on the hologram. 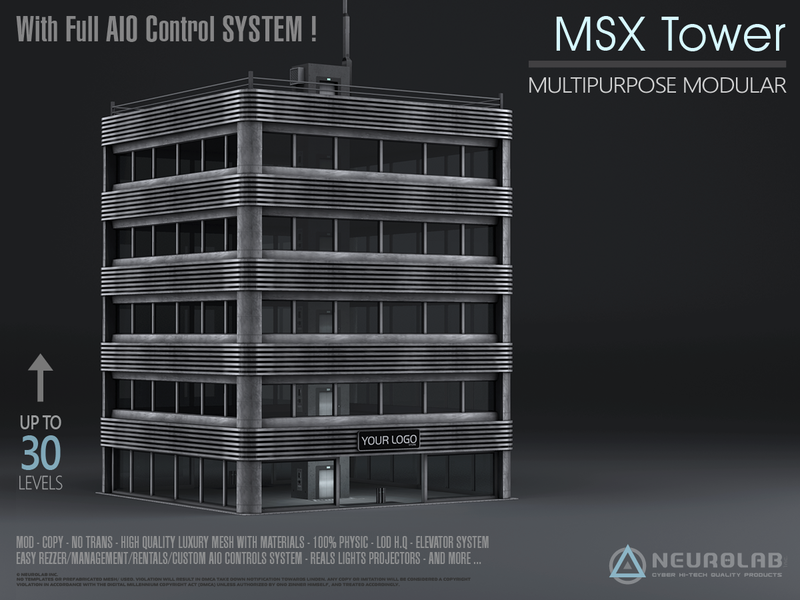 In the MSX, You can Rent each floors separatly. When turning ON set the number of hours between each scan. This feature as nothing to do with land’s auto-return system, it will only return objects that exceed limits* in this level. Setting a price will turn on the rent system. ¤ RETURN OBJ : if the land impact and/or the memory limit is exceeded this will remove as many objects as needed. minutes. People that are not allowed will receive a message and ejected 30 seconds later if they don’t leave this level. You can add some custom objects that tenants will be able to rez in a level (land impact and script memory are used in the limits of this level). To do this they click on “OPTIONS” on the hologram, select “Rez Items”, a room (for example “LivingRoom”) and finally the item (for example “Flat screen”). The item will be rezed and placed where it has to be. To delete this item, they do exactly what they did to rez it. To add an item, open the notecard “Rez Items” in the content tab of the level. First you need at least one room in it. 4) Copy and past the position and rotation in the notecard. one permission per level that’s why we created a relay for this. In all case, you need only one relay per land, no matter how many towers and levels you’re using. – MESH Ultra High LOD resistant !